In the summer of 2014, the number of unaccompanied children traveling from the Northern Triangle of Central America (El Salvador, Guatemala, and Honduras) through Mexico and on to the United States surged. Some undertook the dangerous journey to escape violence, endemic poverty, or recruitment by criminal gangs, while others hoped to reunite with family in the United States. To stem the flow of migrants through its territory, Mexico stepped up enforcement at its southern border and along popular routes through the country, apprehending more than 50,000 such children since 2014. The spike in the apprehension of unaccompanied children—a growing share of whom are girls and children under age 12—has raised questions about how well equipped Mexican immigration authorities are to uphold legal requirements for the protection of minors. 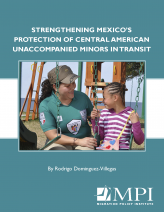 This report draws on previously unpublished data from Mexican government agencies, interviews with key officials, and accounts from civil society to examine the legal framework for the protection of child migrants in Mexico, its implementation, and the gaps between the two during the apprehension, screening, and housing process. Despite a legal framework that emphasizes the best-interests-of-the-child principle and has a generous definition of who qualifies for refugee status, the author highlights a number of areas where further progress is needed if young migrants are to be adequately screened for international protection needs, housed in age-appropriate facilities, and informed of their right to apply for asylum. IV. Recommendations: Where Should Attention and Resources Be Focused?